WITH health and nutrition increasingly coming into focus among red meat consumers, a new line of research looking into concentrations of omega 3 fatty acids in pastures, and how they change during the plant growth cycle is taking on heightened importance. Some commercial beef brand programs, particularly grassfed, make claims about beneficial omega 3 levels in their product. Omega 3 is highly regarded by dieticians for its anti-oxidant properties, and is linked to disease prevention, managing inflammation and reducing stress. While omega 3 has been measured previously in stock feed trials, this was mostly looking at whole diets, concentrates, mixed rations and feed additives – mostly in poultry and pork, researchers said. Some earlier work overseas had examined concentrations in pastures, but no such work had been conducted previously in Australia. 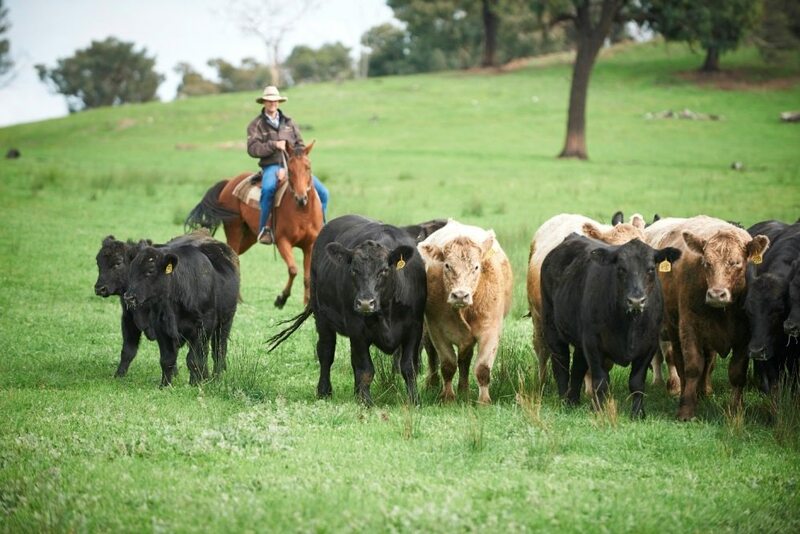 While work has been done overseas to determine omega 3 content in pastures, a recent was the first such analysis in Australia. Results from the NSW DPI-backed project were discussed by researcher Patricia O’Keeffe during a beef nutrition session at the Australian Society for Animal Production conference in Wagga Wagga earlier this week. Project team member Dr Ed Clayton, a livestock research officer with NSW DPI based at Wagga Ag Institute, said it was now well-known that there was an interest in omega 3 from a human health perspective, but to this point, little had been determined about how much O3 was present in pasture, or how much it varied. “Broadly, we know that animals eating pasture will have higher concentrations of O3 in their beef, but what we don’t know is how much is in that pasture they are eating,” he said. 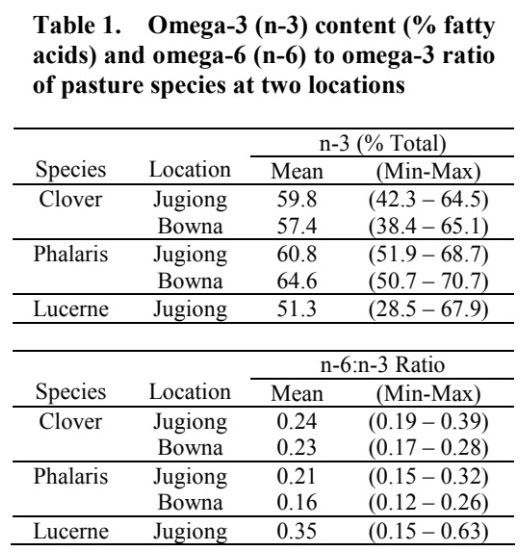 The project examined a range of southern NSW pasture types, exposing a big range of omega 3 concentrations between grass and legume species, combinations of pasture, and at different times of year. The differences identified at different times of year was predominantly related to different stages of growth in the plant’s life cycle, Dr Clayton said. “Not surprisingly, young, green leafy material was found to be quite high in omega 3, because the compound is found in the leaf chloroplasts. But as the plant matures, concentrations declined,” he said. Many cattle producers would be familiar with the ProGraze program’s information on digestibility over the life-cycle of different plant species used in grazing, Dr Clayton said. “What we would ideally like to do with this line of research now is do the same thing for omega 3s,” he said. While the specific project led by Ms O’Keeffe looked only at standing pasture, other earlier work had examined omega 3 levels in conserved fodder in the form of hay and silage. That work had shown there was ‘quite good’ retention levels of omega 3 during ensiling – provided it was good quality silage. “If it is wilted quickly and fermented quickly, there is quite good retention of the lipid which contains omega 3. Little work had been done on hay in Australia, but overseas research has indicated that as hay is dried and cured, there is some energy release from fats, producing some loss of omega 3,” Dr Clayton said. The study discussed at Wagga this week was part of a broader research project, using collected pasture samples looking at animal growth rates. Samples included mixed temperate pastures, but while not a controlled study, the project also selectively sampled different species of grasses and legumes, ranging from clovers to phalaris, lucerne, ryegrass and native pasture species including kangaroo grass and wallaby grass. Samples were taken at different points of the growing season. Individual species data was collected for clover, phalaris and lucerne (see table). Quite large variations can be seen for each at different times of year. “What the growth patterns are for other individual species would be really interesting to know,” Dr Clayton said. Samples from two different grazing sites in southern NSW were used – one near Jugiong, outside Gundagai, which had a mix of native and improved pastures with some clover, and the second at Bowna, near Albury, which had very good quality pasture based on phalaris and southern white clover mixes. All the samples were taken during 2016-17, before the onset of the current drought. Omega 3 concentrations at both sites were correlated with crude protein levels. Samples from both sites were higher in omega 3 for the same species than similar tests carried out in earlier trials in the UK and Canada. As a result of the preliminary work, a database is being assembled for different samples, but this work is far from complete. At least two large beef processors have expressed interest in the project, primarily driven by their large certified grassfed brand programs. So where does the broader project direction go in future? Dr Clayton said better knowledge about omega 3 performance in different pasture species, at different times of year could be used to help ‘underpin’ omega 3 claims on Australia’s quality branded beef products. “In future brand managers may be able to more consistently predict what concentrations of omega 3 will be in the meat, and then wrap their claims around that,” he said. Dr Clayton was not aware of any similar work yet being carried out for sub-tropical or tropical pasture species further north. The NSW DPI’s Feed Quality Service Laboratory at Wagga used to analyse the samples was one of the few facilities in Australia capable of analysing omega 3s in livestock diets, he said. The omega 3s found in pasture species were so-called short-chain omega 3s, which the animal itself converts into the more desirable (from a human health perspective) long-chain forms. “There was a view in the past that a lot of the poly-unsaturates (omega 3) in the grass would be degraded in the rumen, because the rumen hydrogenates those fatty acids, adding some double bonds. But from recent work, it appears there is very good conservation of those fatty acids,” he said. But there were lots of caveats on that: the form of the fatty acid is important; how abundant it is in the pasture; what type of lipid it is in; and what other feed goes into the animal also had an effect. “With silage, for example, even without good fermentation there can still be omega 3 present, but the form of the lipid is different, and can get broken down in the rumen,” Dr Clayton said. “There are still feeding methods that will have to be better understood to optimise omega 3 retention,” he said. This is a most important line of research for the Australian beef industry. As human nutrition proceeds at a great pace, it is exciting to see Australian based research in progress in this important area, so we can stop relying on American studies on lotfed beef which almost brought the Australian industry to its knees, during the misleading and false fat/heart disease scare. Ten years ago as a member of their food futures advisory committee, I tried to persuade CSIRO to take on this exact project, but could not stir up any interest. Well done NSW DPI. Please keep going.